Snooper Laser Pod speed camera detector uses Laser detection to provide alerts to live 'in-use' laser mobile based devices across the UK and Europe. The Laser Pod has been designed to either plug into and use with your sat nav** or as a standalone device, plugging into to your vehicles cigarette lighter adaptor and attaches to your windscreen or rear view mirror. An audible and visual alert then warns you from a range of 1500metres. **Works with most 5volts sat navs - Laser Pod gives a 5V output and comes with a selection of connection cables to suit most sat nav requirements. Snooper Laser Pod has been discontinued. Looking for a speed camera detector with laser detecton? The Snooper 4ZERO Elite BT features radar and laser detection. Snooper Laser Pod speed camera detector is the only detector that we sell that doesn't rely on a GPS database either in part or in full to advise of approaching mobile laser speed traps. Instead the Laser Pod uses Laser detection to provide the alerts to active Laser guns! The Laser Pod does exactly what it says - it will detect mobile Laser devices. Only LIVE mobile Laser guns will be detected. There are no fixed roadside speed cameras which operate via Laser. The Snooper Laser Pod will not detect radar. The Snooper Laser Pod does not have a GPS camera database. If you require a device which uses both laser and radar detection, then the device to consider is the Snooper 4ZERO Elite BT. The 4ZERO Elite BT features a free to update GPS database and radar and laser detection. The Laser Pod is the ideal partner to use with your sat nav, whether it has a GPS database or not. If your sat nav does have a GPS speed camera database, then this will cover all the cameras the Laser Pod can't. There are no fixed roadside cameras in the UK which operate via Laser. While the Laser Pod will provide alerts to live 'in-use' mobile laser cameras that the sat nav can't. Simply plug the Laser Pod into your cigarette lighter adaptor and you are ready to go! Using one of the five adaptor cables supplied you should be able to power your sat nav from the Laser Pod. If your sat nav doesn't work then you will need to use it separately. Don't have a sat nav or just want alerts to mobile laser devices? The Snooper Laser Pod can also be used as a standalone laser detector. LaserPod comes with a choice of mounting options including on the windscreen via suction cup mount and can also be fixed on your cars rear view mirror. It is then powered via your vehicle 12v cigarette lighter adaptor. On approaching a live laser site, the Snooper Laser Pod sounds both audible and visual alerts. Is the Laser Pod legal to use? Yes, the Snooper Laser Pod is completely legal to use in the UK, although *in some European countries it is illegal to use laser detection. We suggest if you plan to use the Laser Pod outside the UK, that you find out whether it is legal to use in your country. Simply plug the Laser Pod into your cigarette lighter adaptor and you're ready to go! Using one of the 5 adaptor cables supplied you should be able to power your sat nav from the Laser Pod. If your sat nav doesn't work then you will need to use it separately. Question: Does the Laser pod detect fix cameras? Answer: The Snooper Laser Pod detects fixed and mobile devices using laser technology. In the UK none of the fixed cameras use laser technology, therefore in the UK the Laser Pod detects mobile laser based systems e.g. Police handheld laser guns. For detection and alerts to the vast majority of fixed and mobile speed cameras in the UK I would recommend you purchase the Snooper 4ZERO Elite BT. The 4ZERO Elite BT encompasses laser detection, radar detection and a GPS database to cover far more speed cameras types both fixed and mobile. Question: I have an old Snooper neo - S3 neo or S4 neo. Will the laser pod plug into this? I also have a TomTom 5100 and I am fairly sure there is no way to plug the laser pod into this. Answer: The Snooper Laser Pod is unfortunately not compatible with the Snooper S3/S4 neo. However, both of these models feature a built-in laser detector. 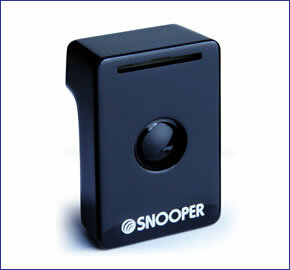 The Snooper Laser Pod can be used as a standalone device and includes a vehicle cigarette lighter cable. Do you have a question about the Snooper Laser Pod? Submit your question via our contact page.